Since empty wine bottles are non-returnable, there should be a way to make use of them instead of having them pile up at landfills. Fortunately, wine bottles can be turned into works of art with a little embellishing. I have found several wine bottle crafts, from around the web, that I want to share with you here. In an earlier post, I published a tutorial on making a birch vase out of a wine bottle. 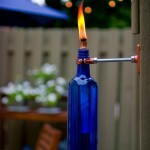 Now I want to show you some more great ideas for re-using your bottles. 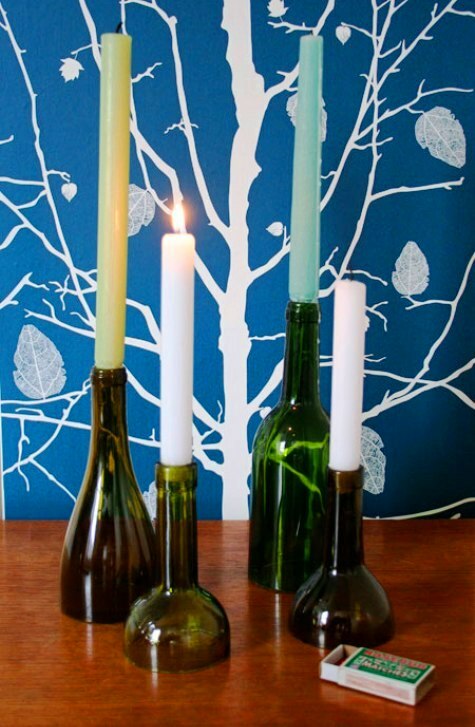 This first idea by re-nest is a simple but very useful way to make use of your wine bottles. 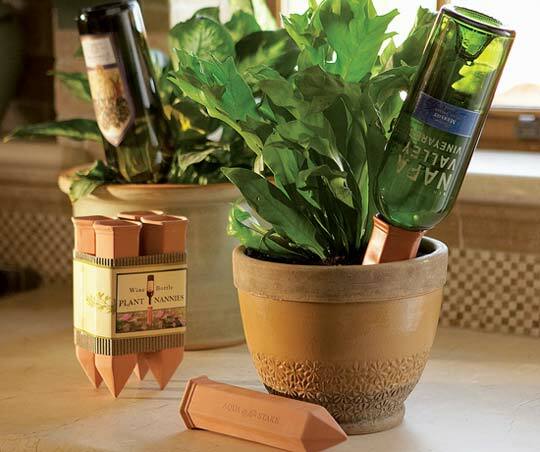 All you need is a package of plant Nannie stakes and you can insert your most decorative bottles into your plants for continuous watering. You actually don’t even have to use the stakes. 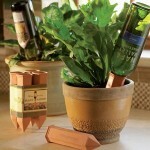 Instead you could fill your wine bottle with water and tip it over into the planter. The dirt will clog the bottle opening allowing for a slow trickle of water. What a great way to ensure that your plants are getting watered when you are away! I love this idea from Garden Web for making lighted wine bottle decor. This craft takes some special tools but the resulting lights look to be worth it. These would be a great decorative way to have a night light. Another idea that I have seen is to fill the wine bottle with glass grapes as well as the lights. It would make a very romantic table light. This time of year we tend to spend a lot of time outdoors. 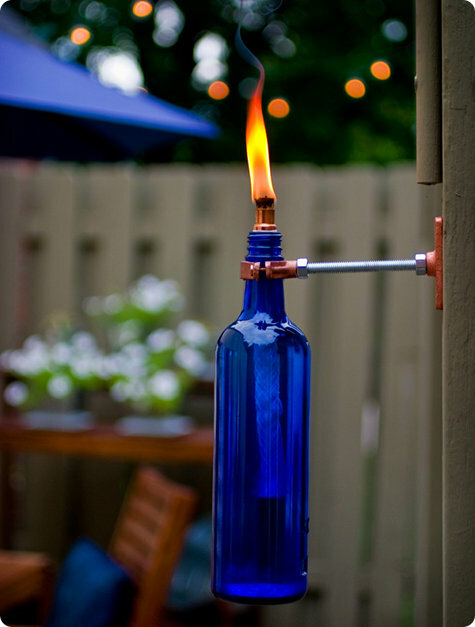 Turn your empty wine bottle into a fun tiki torch to light up your patio. Design Sponge has all of the instructions for making these outdoor torches. 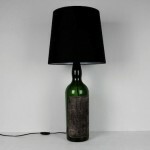 And, for indoor lighting, who can resist this chic table lamp made from a wine bottle. 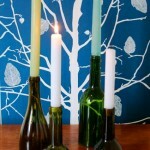 This idea from remodelista.com is an excellent way to add some fun lighting to your home. 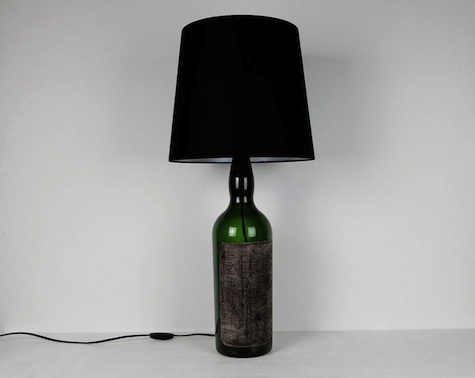 The tutorial is not too hard and the look can be made custom with the color of wine bottle, type of lampshade, and shape of bottle. For a romantic look, this candle holder idea is just the ticket. I love this setting with all of the different sizes and shapes of bottles. 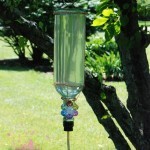 This last idea for a hummingbird feeder is one of my favorites. Check out the full tutorial at Allie Makes. 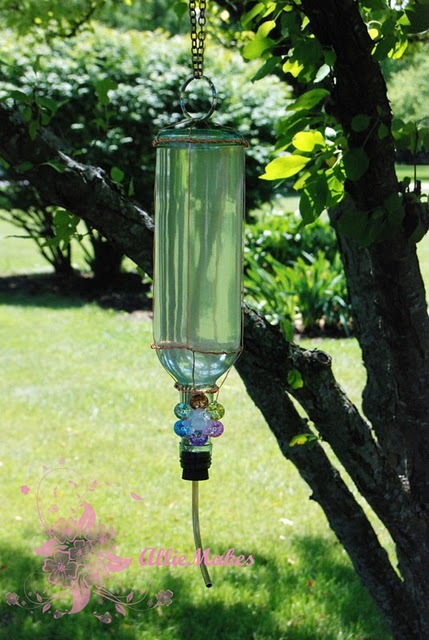 If you love to watch birds, this craft is a must do. I can picture this just glistening in the sun with the glass and embellishments. What a pretty way to decorate your yard! Where can I buy the plant nannie stakes?